It takes the right communications tools to keep pace in today's changing business enviroment. Weather you want to expand your business, open a new office improve customer service or simply lower your costs, check out at OCEAN ELECTRONIC. The perfect communications solution for any business of any size. The PABX System configuration lets you expand as your needs evolve. Start with basic unit, and extends all the way to the maximum port of each type of pabx. You get the flexibility to increase your communications capabilities as your company grows, without purchasing a whole new system. Hinger Productivity, Greater Customer Satisfaction. Intelligent call management can raise business efficiency, increase customer satisfaction, and improve your company's image. PABX features has a built in answering call system which places all incoming call to available stations (depend on program). The more advance system is using automatic operator, every incoming call will be answered by pre recorded message and callers can directly goes to the desired extention. You wont miss the call..!!. There are 2 type of pabx that support for office or hotel system. This kind of system only link for the billing connection only, we cant control every trafict in our pabx. All features must be manually setup. Such as morning call, check in Check out, mini bar, and etc. This semi computerise system suit for office, small hotels, villas or bungalows that doesnt need all computerise system. The pabx that include in this system such as ; PANASONIC, LG, NITSUKO, SAMSUNG. We recommend you to buy panasonic, we have an experience for others type, no parts available, and we have to send our system to jakarta or wait for the parts for weeks even months.For panasonic we have our own technision that qualified enough to repair every panasonic product. For the price comparasion, PANASONIC has a better price. This System Link to computer and computer will organize all the features we want. All trafict call will be on the computer screen. For Hotel system this is the right system. It can accomodate all the hotel features. Morning call, check in check out, mini bar, Telephone billing can be control through the PC. For examp, when the guest check in, we must input name, date, room, and ext, after we enter then the telephone on the room will be opened, and when the guest check out, the telephone bill and mini bar automatically goes to computer central and all in one bill. For this we need hotel system. The pabx that includes this system are NEC, SIEMENS,AT & T,NORTEL. Especially for NEC it has 6 open port that can be programmed for various purposes, for examp, we can have raw data for all outgoing calls besides the one that goes to computer billing. Other pabx doesnt have this features. PABX HOTEL SYSTEM has 6 output that can be used for many purposes, such as ; computer telephone billing system, Direc printer connection for raw data telephone billing without price, live programming, hotel system connection. HOTEL SYSTEM CONNECTION; this can be used for full computerised System (see above detail) so every room that call operator, their name can be displayed on the telephone operator, so operator can directly knew whos the caller. 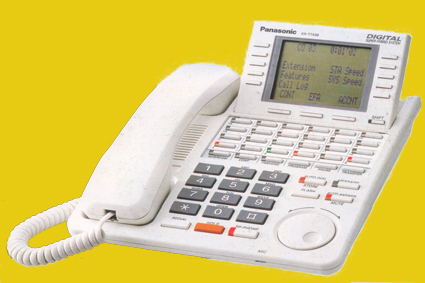 TA series is the smallest type of telephone system in panasonic product. it starts from 3 incoming lines and 8 extentention (branches). It can be expanded with the second card become 6 line and 16 extentions. And it still can be expanded and become 6 incoming lines and 24 extentions, by simply adding a new digital card. This TA series suits for office & small bungalows or villa. For office features this type of pabx is more than enough. Start with Accound code, toll restriction, call duratin limit, system speed dial, station hunting and there are still more features. For Villa or Small bungalows dont expect more for villa features from this pabx, it can be connected to billing system though. But for hotel features such as morning call, check in check out and other hotel features is not available. This pabx also equipt with automatic operator (optional) so every incoming call will be answered by pre recorded greeting and guide the caller to desired station. This is the second bigger type of panasonic product. It start with basic type which can accomodate 8 Incoming line and 16 Digital Extention and 16 Analog Extention (usuall handset). It can be expanded by simply adding card. we can add Incoming line or extention. if we add extention card it will expand up to 32 analog extention and still can be expanded up 128 extention (maximum). For Villa Features or Office Features this system is undeniable. Morning call, check in check out, one digit numbering, billing connection and still many others features are available for this system (click hotel & villa features for more information). This is the biggest telephone system that panasonic has. Start from 8 incoming lines and 40 extention, it can be expand up to maximum 512 pot. All features in above system are available in this type. and more additional features such as 16 KHZ system is available in TD 500 SERIES. 16 KHZ System is used for billing purpose, it can detect the call is connected or anwered by the opponent or not. so there are no false billing with this system.